We’ll be the first to admit that it’s hard to keep up with the latest and greatest decor trends. Not only are they constantly changing, but views vary wildly: One designer says something’s in, while another says it’s out. And that’s nothing to say of your opinion on the matter. But if you’re seeking inspiration—or heck, maybe you just want to look at some beautiful photos and dream—we’ve got you covered. We consulted with dozens of design experts from coast to coast to unveil the biggest decor trends we’ll see in 2019. Some have been subtly sneaking into our homes for a while, ready to take center stage. Others are taken straight from the runways in Paris and New York—big, bold, and primed to be integrated in small doses into our spaces. These decor ideas promise to do just that. 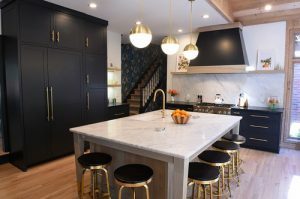 Striking and memorable—with a bombshell or two in the mix—these top trends are a great place to start your redesign wish list. Anything that looks like the work of a detail-obsessed artisan will be right at home in 2019. Whether it’s a handcrafted headboard, a standout chair, or a custom metal-framed mirror, a few artisanal elements will keep things interesting without the pressure to commit an entire space to the look, says designer John Linden of MirrorCoop in Los Angeles. We’ve been slathering rooms in icy, aloof grays for quite a while now. But in 2019, the pros say this neutral’s cool edge will thaw a bit. “We’re just ready for a warmup all around,” echoes Portland, OR, designer Justin Riordan, who predicts we’ll see a fresh slate of “fleshier, pink-ier” naturals in the coming year. Speaking of pink, the flowery hue is still decidedly in the moment. You’ll continue to see the pale “millennial” variety, of course. But get comfortable with her bolder raspberry-toned sister making a statement, says designer Bethany Adams of Bethany Adams Interiors in Louisville, KY. In fact, Adams thinks the audacious shade will be right at home even in a prominent spot—like your kitchen cabinets. On your walls, however, expect a less pink pink—it’ll be all about those peach tones. “This shade is surprisingly versatile, pairing well with mustard, orange, or even dark green,” she says. Design gurus envision a star turn for tweed, a tightly woven wool which shares velvet’s impact but isn’t quite as extra. Made from a mix of glass, granite, marble, or quartz chips suspended in a polished cement or resin, this midcentury mainstay was once the de facto flooring option in schools, hospitals, and airports, thanks to its durability and thrifty price tag. But these days, terrazzo has reemerged as a retro-luxe choice, popping up in every room of the house, Linden says. Larger patterns in a slew of shades give this throwback a fresh feel on everything from coffee tables to shower walls. 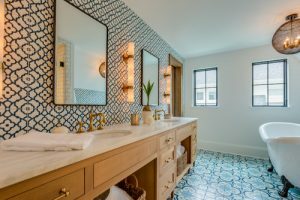 You’ve probably already noticed intricate tiles—Moroccan, herringbone, and other geometrics—swooping in to take the place of ubiquitous white subway tile. But Blaszkiewicz predicts tile will get even more interesting in 2019: Expect to see colored grout and contrasting tile on the walls and floor. 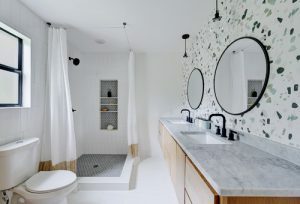 “Like wallpaper, [tile] is an easy way to create a focal point in the room,” she says, recommending dark tiles with light grout and vice versa—for a punch of dimension and texture. Aiming for a more monochromatic vibe? Just sync the tile and grout to match. “It’s a thoughtful detail that can really make a bathroom look more expensive,” she says. 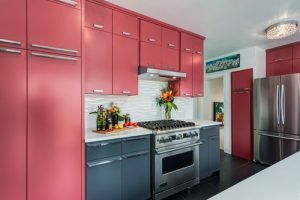 The all-white kitchen has been singing its swan song for the past couple of years and, as such, we’ve been slowly adding color back in. In 2019, designers say we’ll rip off the Band-Aid and embrace the white kitchen’s alter ego. Hectic schedules plus nonstop technology have made the simple act of sitting down to talk to one another a lost art. But we want the intimacy back, says Karen Wolf, creative principal at Karen B Wolf Interiors in New Jersey. So we’re seeing sofas, settees, and chairs become more curvaceous, she says. “Gone are the days of big, boxy sofas—granted, they will always have a place in an oversized room or basement,” Wolf says. But more and more those looks are being replaced by curvier forms, which in the past were used primarily in formal (and uncomfortable) living rooms. “Today, the curved sofa and chair have maintained their elegance but added comfort—which is key,” Wolf says. 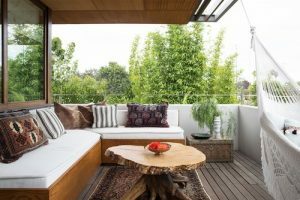 There’s a theory in the interior design world that what we see on the fashion runways in spring and fall will dictate what appears in our home decor the following year. And this year, Paris and New York were all about florals. “Floral patterns will take root and show up in stores on bedding, pillows, chairs, and wallpaper, whether you’re ready for them or not,” says Jill Hosking-Cartland, owner of Hosking Interiors in Windham, NH. But we’re not talking about Grandma’s dated floral prints. Today’s blooms are also big, bold, and often abstract, offering up larger-than-life interpretations of a flower, Hosking-Cartland says. 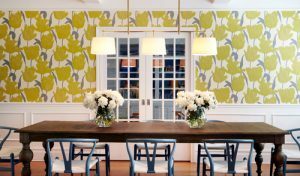 If you’re ready for a break from chevron, trellis, and geometric patterns, this trend could be for you. The best for last: Expect 2019 to go to the dogs—in the cutest way possible. 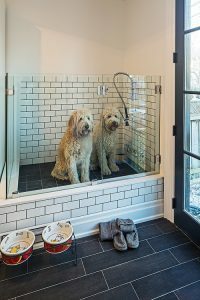 A dog shower doesn’t require much square footage, and doors are unnecessary. But if you’re feeling ambitious, you can decorate with lively tiles. “Since dogs are our family members, I think this is a trend we’ll see more of,” Wagner says. Rachel Stults contributed to this story. Questions About a Remodeling Project?